This is one of a series of articles about sprite histories (see: Mario, Sonic, Castlevania, Bonk, and MegaMan). There are six Wonder Boy games. There are two number threes. There is no number two, four, or six. …And it gets a little weird from there. escape (small e), later named Westone, created the series. Sega published the games and owned the Wonder Boy name, but Westone also licensed the game to Hudson, who changed the graphics and featured their popular representative, Takahashi Meijin. When the popular arcade game came to Sega’s home consoles or computers, it was Wonder Boy. When it was brought to any other console, it was renamed. Most of the time. Except when it wasn’t. And the naming conventions were, to put it mildly, somewhat convoluted. Hudson was responsible for all the non-Sega releases (well, most of them), but couldn’t settle on one name, and so released four. The one everyone remembers is Adventure Island, for Nintendo’s consoles. 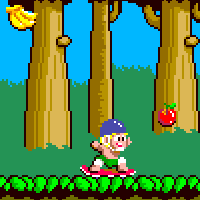 The Adventure Island games were based, sometimes loosely, on the first Wonder Boy game. Takahashi Meijin no Bouken Jima (Takahashi Meijin’s Adventure Island) was simply Adventure Island outside Japan. Eight games were released in this series, all of them featuring running, jumping and fruit collecting like the first Wonder Boy. Plus that one game released in Japan called Adventure Island, (which was nothing like the other eight). Sega and Westone were no better. Between the three of them, Wonder Boy was sometimes Monster Land, or Monster Lair, or Monster World. Or Dragon’s Trap, Dragon’s Curse, Drancon’s Revenge. Some games had no number, some had the same number, some only had a number if you plugged them in to the wrong system. 1. If it was released by Sega, it was a WonderBoy game. Except the last one. And the Game Gear one (except in Japan). 2. There are two number threes, and that’s odd, but let’s accept it and move on. 3. There is no number two. Or four. 4. If it was released by Hudson, it could have any of three hundred different names, numbers, or themes. The same for Sega. 5. There was also Saiyuuki World by NMK/Jaleco. 6. And some WonderBoy games were released by TecToy in Brazil, with new character sprites, based on the popular Monica’s Gang comic there. OK, let’s try this another way. The first Wonder Boy game was a tropical-themed exercise in fruit gathering, and from here the two series’ diverged: WonderBoy innovated and changed its theme as often as it could, while Adventure Island took the proven fruity speed-running concept and gussied it up a little with every release. As you can see above. the first Wonder Boy and Adventure Island games are nearly identical. The first game in the series had the same Wonder Boy name on all Sega consoles: the SG-1000, the Master System, and the GameGear. Actually, the Game Gear version was called Drancon’s Revenge outside Japan. I mean, of course it was. The Master System sprite was surprisingly faithful to the arcade version. But while the Master System was a capable if under-appreciated console, the primitive hardware in the SG-1000 system required a significant rework of the sprites. The resulting low-res, low-colour sprite barely resembles the original. At about the same time Hudson’s Adventure Island series (not the renamed Wonder Boy III: Dragon’s Trap Adventure Island for NEC’s PC Engine, but the Takahashi Meijin no Bouken Jima Adventure Island for the NES and SNES) saw its release, and solid sales. So, the first Wonder Boy was also Adventure Island. That’s easy, right? Sega made the former, Hudson made the latter, and they’re very similar. All of the Adventure Island games (not the Japanese Adventure Island, of course) were basically the same. Tropical, run, jump, collect fruit. It’s interesting to see how the increasing graphics capabilities of each system gave the artists more room and colours to play with. The three sprites above are 32, 38 and 48 pixels high, with 4, 13 and 15 colours respectively. There were four Takahashi Meijin / Adventure Island games released for the Famicom/NES, and two for the Super Famicom/SNES. The PC Engine only saw one release, which is unfortunate. It was probably the sequel that held most true to the original. Four Adventure Island games were released for the Famicom/NES, but 2 and 3 used the same sprites. There was a significant improvement in clarity in the second two games, but the last game had a smaller sprite. Probably a case of changing things up because things were getting stale, the player weapon was also changed. The PC Engine game featured sprites that were a marked improvement over the NES versions, but it was soon overshadowed by the larger, more detailed Super NES sprites. Hudson’s artists were freed from most practical limits by the SNES hardware, and combined with their years of practice, the new SNES sprites were big, colourful and detailed enough for players to realize just how unattractive an avatar Takahashi Meijin (Master Higgins in the West) actually was. Unusually, for the second SNES outing, the player’s starting attack is a punch, not an axe (or even a bone). And that leaves us with the sprites at the bottom of the bin. The rather execrable MSX version was mostly sunburn-red, didn’t feature a throw animation, and the weapon was an all-white boomerang thing. The GameBoy fared rather better, but it’s a testament to the skill of the artists, and not the hardware: both the MSX and GameBoy sprites have only three colours. There were also three ports to three home computers, and the results were somewhat… interesting. The primitive hardware of the time required a lot of creative interpretation, and it’s very interesting to see how the artists coped with the hardware peculiarities. The ZX Spectrum sprite is particularly interesting, as the hardware limitations forced a severe re-imagining of the sprites – and it had no throw animation. But enough about Adventure Island, let’s talk about Wonder Boy. The second Wonder Boy game caused quite a stir in arcades, as it was one of the first (and still one of the very few) arcade games to include RPG elements. In the arcades games were meant for short-time play, three minutes being the golden rule for operators trying to eke out a profit. A game with weapon upgrades and a plot was very out of place, but the players loved it. It was ported by Sega to their Mark III console as Super Wonder Boy: Monster World (but renamed to Wonder Boy in Monster Land for the Master System release); by Hudson to the PC Engine as Bikkuriman World (a licensing effort featuring characters from the anime series of the same name); by TecToy to the Brazilian Master System as Mônica: No Castelo do Dragão (Monica in the Dragon’s Castle); and in a heavily modified form, by Jaleco to Nintendo’s NES as Saiyuuki World. So that’s four console ports, only one featuring Wonder Boy, and none featuring Takahashi Meijin. It becomes difficult to compare the sprites directly when only two of the five are the same game, and even then the arcade Wonder Boy started off with nought but his underwear, and the Master System Wonder Boy came outfitted with armour instead. It’s easy to see how the first three sprites are not significantly tweaked, with the same poses, but the Monica and Saiyuuki games received wholly new sprites. The latter was the only game to feature levels that were significantly different as well, the other four games didn’t stray as far from the original formula. This was sort of a rubbish era for WonderBoy. Both the Atari ST and Amiga sprites were identical, as were the Amstrad CPC and Sinclair ZX Spectrum sprites (though at least the latter two used different colours…) The Spectrum and Commodore 64 sprites were both vastly improved over the previous games, taking advantage of different graphics modes offered by the hardware. This game set the completely random tone for the rest of the Wonder Boy series. What started as a fairly solid skateboard simulator (with a fruit-gathering side-quest) became a platform action-RPG, and the next step, of course, was a shooter. The first third Wonder Boy was as different from the lite-RPG second game as the second was from the skateboard-riding tropical romp of the first. This time the fruit collecting was back, but the game was a platforming shooter where the player was forced, by non-stop level scrolling, to keep moving and complete the stage. The second half of every stage was a slightly more traditional shooter where the player rode a flying dragon and was tasked with destroying a level boss. Wonder Boy was no longer the popular game it once was, and the third title received only two ports: one miserable looking cartridge release on Sega’s MegaDrive/Genesis console, and a surprisingly authentic CD ROM release for the PC Engine. Interestingly, the PC Engine version was the only non-Sega console release called Wonder Boy – in Japan at least. It was released in North America for the TurboGrafx CD without the Wonder Boy prefix, and was called simply Monster Lair. The MegaDrive/Genesis version is so weedy looking I can’t help but think the artist drew it from memory, where the PC Engine version is pixel-perfect. The second third game was first released for Sega’s Master System. As if it wasn’t confusing enough already, it was called Wonder Boy III: Dragon’s Trap in North America and Europe because it was the third Wonder Boy game on Sega’s Master System. It was in fact the fourth game in the series. It never saw a Japanese Master System release, but if you plug the game cartridge into a Japan-only Mk-III console the title appears as Monster World II (though the preceeding games were Monster Land and Monster Lair – which one has a stronger claim to the Monster World One name is anyone’s guess). Bizarrely Sega released it for the Game Gear in Japan without the WonderBoy name, calling it simply Monster World II: Dragon’s Trap. Because sanity was completely lost by this time, they named it Wonder Boy: The Dragon’s Trap (without the III) on the North American Game Gear. TecToy released it in Brazil as the second game in the Monica series, called Turma da Mônica em O Resgate (Monica’s Gang: The Rescue), and Hudson released it on the PC Engine, in Japan as Adventure Island and in North America on the TurboGrafx as Dragon’s Curse. The sprites here are very interesting. The Master System (left) and PC Engine (center) sprites are nearly identical, and the latter benefited only a little from the additional colours. Whoever drew the first sprites on the Master System was clearly good at their job. And the Monica sprite looks better than its first game, as well, with more colours and character, despite the smaller sprite size. Because there was absolutely no reason to pretend the naming conventions made any sense at all, the game that followed the two threes was called WonderBoy V: MonsterWorld III. WonderBoy four was skipped entirely, and despite the previous games being called Monster Land and Monster Lair, this new game was called Monster World 3. Someone somewhere decided that a pretense of sanity wouldn’t go amiss, and it was released without numbers outside Japan, as WonderBoy in Monster World. It was successful enough to receive a port to the PC Engine and TurboGrafx, called The Dynastic Hero, and was the third and final Monica game in Brazil, titled Turma da Mônica na Terra dos Monstros (Monica’s Gang in Monster Land). In an unusual move, Sega back-ported the game to the older Master System for a European release (where the console was still weirdly popular). There was no Wonder Boy Six. Giving up on the whole Wonder Boy thing entirely, Westone’s final release in the series featured a female protagonist, and the game was called simply Monster World IV. It is without doubt one of the finest looking games for the MegaDrive, and though a very linear experience, it is one of the best platform games available anywhere. It was clear by this time that the artists at Westone had developed some significant pixel skills. The player, levels, NPCs and enemies were perhaps the best to ever grace the Megadrive, and indeed, any video game system. But this is where WonderBoy ended. A vast, sprawling collection of adventures where most of the games weren’t even called WonderBoy, a series where names meant little and numbers even less. The passion and talent that went into these games is staggering, and every single one is worth playing. Except maybe Wonder Boy III: Monster Lair on the MegaDrive.